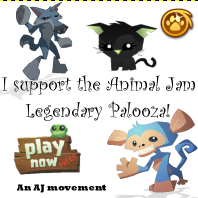 Animal Jam Legendary Palooza: BORING. Sorry for not posting yesterday:( My internet was being super duper slow like usual. So I didn't get a chance to post. I hope you all understand! In other news my most recent contest is ending soon so you better enter it if you haven't already! Call the recoloured square glasses sold in jam mart clothing 650 gem! Yes these are pretty well super boring. 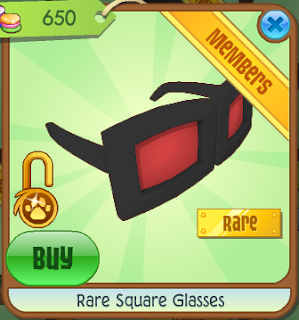 I would of expected a different item but in this case this item shouldn't even cost 650 gems! It should be more like 500 gems. Now be prepared to see today's rim turn into something awesome! See what I mean? I even changed the price and name. Becauz I got SKILLZ yus I got skillz. Last weeks mystery was super tough! IT WAS IN CLUB GEOZ! Im sorry for always forgetting to say who won and giving the prize and saying what the land was. 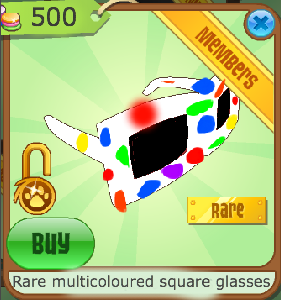 Comment the exact location of this item for a chance to win a prize! Does anyone have any mini challenge ideas to do? If so please comment them down! Bunnies love to eat ________ and _______. 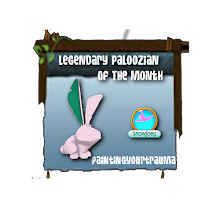 Animal jam legendary palooza is the ________ blog ever. I like to dig up _______ from the ____________ because it is _________ fun! No answer is right or wrong. You can make answers funny or sad or dumb or anything you like. Bunnies love to eat honey and mustard. 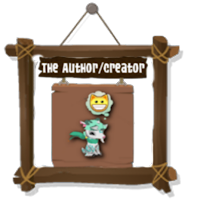 Animal Jam legendary palooza is the best blog ever. I like to dig up frogs from the pond because it is not fun. AJHQ is the laofdhfndbculdsncdlsfhcc grass? I hope you enjoyed this challenge! 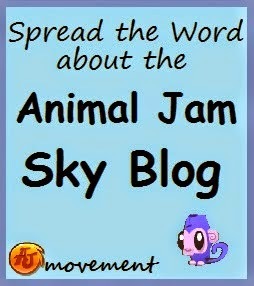 And I need to change this blogs template too! I like to dig up dinosaur bones from the bottom of the lake because it is weirdly fun! :DD And the MM is in Jam Mart Clothing! 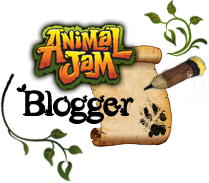 The Animal Jam Legendary Palooza is the most Lagundary blog eva yo. I love to dig up black bananas from my garden because it is supafridgestickcalidociously fun. AJHQ is actually that turtle that the buny ate. 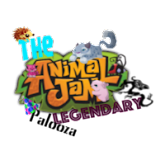 The Animal Jam Legendary Palooza is the most supafridgestickcalidociously best blog ever! I love to dig up dirt because it is yummy and absolutely amazingly weirdly awesomely freekily fun. AJHQ is amazingly bad at noticing glitches. I love AJ because __________________! Bananas are _______________ because ________________. and sometimes very very ____________! This blog is ________ because _________ and stuff! I keep using explonation marks because ___________! AJ should make ________ to be happened more often, and this is because___________. I am very not talented at ______________ but I am very talented at _________. I love AJ because of my buddies! and sometimes very very awkward! This blog is superb because it's amazing and stuff! I keep using explonation marks because it's really fun! AJ should make hiting three diamonds on the daily spinto be happened more often, and this is because I haven't got diamonds from the daily spin since AGES.